Carpathia provides high end hosting solutions and IT infrastructure services for clients with massive IT and hosting needs. Based in Dulles, Virginia, Carpathia caters to large corporations and government agencies including the US Department of Defense. 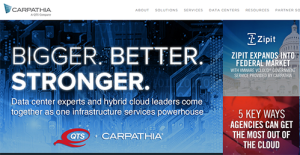 Boasting of more than 100 data centers located in North America, Europe, and Asia Pacific, Carpathia has some of the world’s most secure, connected and compliant facilities. This ensures that Carpathia’s services are available and that security to critical IT operations is never compromised. How Much Does Carpathia Hosting Cost? There is no information available on the type of control panel provided by Carpathia. Each business is different, and might call for a particular type of solution that will be fit for their company size, type of customers and employees and even specific industry they cater to. You should not count on finding an ideal service that will be suitable for every business no matter what their history is. It may be a good idea to read a few Carpathia Hosting reviews first and even then you should keep in mind what the hosting service is intended to do for your company and your employees. Do you require a simple and straightforward hosting with only essential functions? Will you really use the advanced tools needed by experts and big enterprises? Are there any specific features that are especially practical for the industry you operate in? If you ask yourself these questions it is going to be much easier to get a reliable service that will fit your budget. We realize that when you make a decision to buy Hosting Services it’s important not only to see how experts evaluate it in their reviews, but also to find out if the real people and companies that buy it are actually satisfied with the product. That’s why we’ve created our behavior-based Customer Satisfaction Algorithm™ that gathers customer reviews, comments and Carpathia Hosting reviews across a wide range of social media sites. The data is then presented in an easy to digest form showing how many people had positive and negative experience with Carpathia Hosting. With that information at hand you should be equipped to make an informed buying decision that you won’t regret. What are Carpathia Hosting pricing details? Do they enable you to effortlessly set up a website without any HTML or coding knowledge? Carpathia offers advanced hosting and IT infrastructure solutions, which includes customized websites. Though their support may include initial setup, a significant amount of website building and coding expertise may be necessary for users who want to get involved with the site building process. Carpathia maintains many data centers all over the world, all flaunting top security measures such as 24x7x365 security and monitoring teams to ensure that their networks are working and safe from any unwanted access and breach. Carpathia accepts payments via major credit cards. Carpathia offers Enterprise-grade packages that could suit varying eCommerce needs. There's an indication that Carpathia supports both Linux and Windows hosting. If you need more information about Carpathia Hosting or you simply have a question let us know what you need and we’ll forward your request directly to the vendor.